On the beach, your happy place! As good as it gets when it comes to beach front holiday rentals! Delightful apartment as close to the beach as you can get and right in the front so nobody can look in on you. This was my parents home away from home and has all amenities one needs: washing machine, stove/hob, microwave and TV. Huge rooftop terrace for private sun bathing or sun downers or braai with friends. The complex has a pool and a garage for one car is part of the deal plus one open parking. Step out of the complex and onto the beach. Restaurants/shops are 1 min away! This apartment is a TRIPLEX and all rooms have a balcony and face the beach. The one bedroom has two single beds which can be pushed together and the second bed room has a queen sized bed. Both rooms have cupboard space and are on one level with the bathroom (tub/toilet and basin). The rooftop terrace is unparalleled when it comes to chill out spaces! Here is also the shower and a guest toilet with basin. Outside table and braai are stored here. All rooms have ceiling fans the and uncapped WIFI is available free of charge. If a maid is required do let me know so it can be arranged at a fee. Umdloti is a lovely village, especially on the south side, where the apartment is located.There are nice rock pools for the kids and good surfing for the more adventurous. Fishing and dolphin viewing trips can be arranged in neighboring Umhlanga. A number of really nice restaurants are minutes away and big city shopping a mere 15mins drive. I am Antje, your host and am married with two daughters. My family is very busy and outdoors is where we play; swimming, running, paddling, horse riding and mountain biking. Being German, I like it neat and punctual. Having a good instinct, first impressions count a lot for me so I hope you like what you see when you step through the door and treat the space with respect. Should you require something or have any suggestions, please do let me know. I live a mere five minutes away and will do my utmost to assist as far as possible. english, german, Some left over Spanish and French from years ago.. I am German and live in South Africa since 1997. I am married to Clive and we have two daughters. My parents bought this apartment to spend time with us after they retired. For 16 years it was their happy place and I hope it will make many happy memories for you! 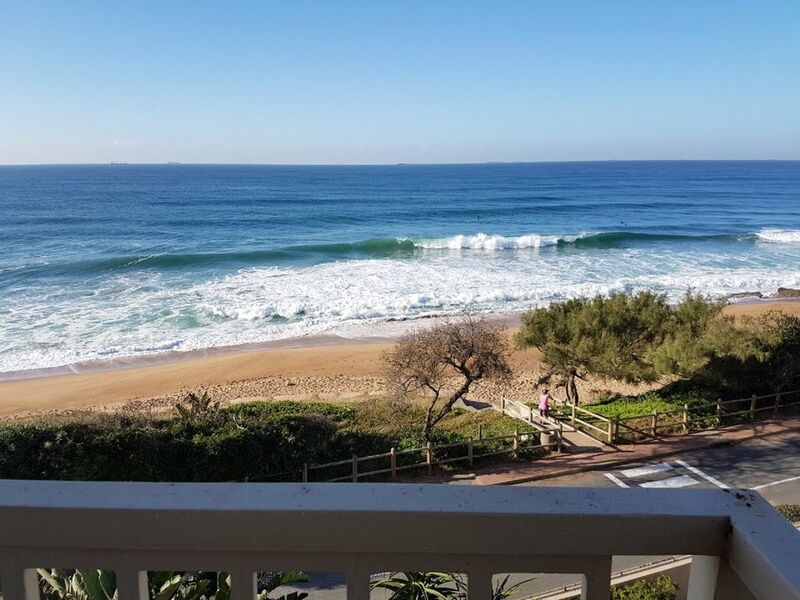 It is one of the oldest but best apartment blocks in the village of Umdloti, which is one of the prime holiday villages in KZN if not the whole of the SA coast. Here is still SPACE, i.e. there is a generous garden with a large pool in the middle of the complex with direct access to the beach by a pedestrian gate. There are only 32 units and each flat has their own garage plus one open parking. The view, when you step onto the balcony is breathtaking! The apartment is spacious and uncluttered but comfortable. One of my artist friends painted the murals on the walls. Fall asleep to the sound of the sea and wake up to spectacular sunrises! There is no property with a better view! The apartment block is right on the beach. You can't get any closer than that. The apartment is a triplex, meaning there are three levels connected by stairs. The living are is on the ground floor, bed rooms and bathroom on the second and roof terrace with shower/toilet on top. Host can assist with this. This was the home away from home of my parents for 16 years! It has generated many happy memories for our family and I hope you enjoy the space. All we ask is that you treat it with respect. I live a mere 5mins drive away and will assist as best I can should there be any requirements. We had a very pleasant stay, with our only regret being the fact that we had to leave before we wanted to. I was also rather disappointed that I was not able to solve the intricate hosing arrangement in the shower upstairs!! The basic shower was easy to operate, but I could not realise the seeming potential offered by the rest. Barbara has suggested that you might consider putting or painting a white strip on the edge of the last 2 (wooden steps) down from second level to the first, as the transition from the white tiled steps to the wood tends to be obscured by the fact that the steps blend in with the floor. The apartment was very comfortable and well designed. Umdloti is a gem on the North Coast of Natal. Still homely and quiet compared to the busy Umhlanga next door, this is a quaint village where people know each other and locals are friendly and helpful. Some of the best restaurants in the greater Durban area are right here and the tidal pool on the north side of the village provides safe bathing and swimming.